Impulse noise or impulsive interference is one of the major distortion factors in TV broadcasting channel performance. AGC needs to be immune to impulse noise interference when adjusting the video signal. One way to handle impulse noise is clipping the signal to some level. Before clipping, the level of the signal has to be adjusted (amplified or attenuated) by Automatic Gain Control (AGC). The issue is that AGC controls the gain based on the signal distorted by the same impulse noise. It means that AGC has to be immune to the impulse noise. At the same time, big and rapid changes of the signal level have to be handled. 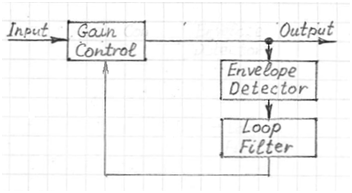 AGC is a loop, as shown in Figure 1, that consists of an Envelope Detector, Loop Filter and Gain control. The envelope detector detects the average level of the signal coming from the gain control. Usually, the envelope detector consists of a signal absolute value extractor and a lowpass filter. For impulse noise, the output of the Envelope Detector is a sequence of high amplitude impulses. For a rapid signal level increase, it’s a step function. 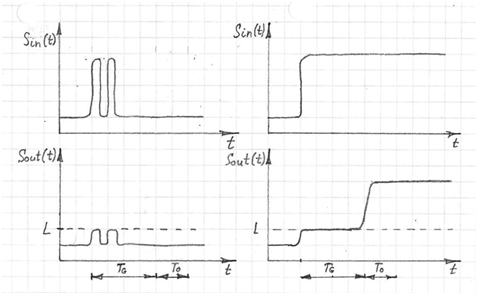 To distinguish between these two cases the decision block has to be implemented at the output of the lowpass filter. Impulse noise may be modeled as sequence of bursts that have a particular burst duration TB. Each burst appears with burst spacing TS. If the level at the output of the envelope detector low pass filter increases by some big value that is above a certain threshold L, the decision block clips the output to the level L and initiates a counter. When the counter time is greater than the guard time (TG>TB), the decision block stops clipping the input value but only during a certain time interval TO, (“opening” time). After TO it starts clipping again. This basic algorithm makes AGC to be virtually immune to impulse noise. For the case of a big and rapid change in the signal level, AGC will react with the delay TG.